There must be more but I can't think of them, what other classic 80s kids/comedy films are there that were set in Australia? I was obsessed with MAD MAX and MAD MAX 2. Has anyone seen Puberty Blues??? This is my alltime favourite, if you want to see the 'real' aussie upbringing, this is exactly it. Very funny! There also was Moving Out (Vince Colosimo) and his next one Street Hero. Bet no one has seen these ones. I won't keep going 'cos I don't think all the ones I can name were exactly box office big names. oh yeah...duh, that's right...The Road Warrior came out in the early 80's. Well then...that's TWO movies from the greatest film series ever. Hmm...will take a bit to think of 80's Aussie films that I like, aside from BMX Bandits. However, I can add Walkabout (1971), Flirting (1991), and Proof (early 90s?) to the list for other Aussie films. I have Walkabout and Flirting on DVD, but not Proof. If anyone sees it on DVD, let me know. Thanks. Fever (1987). This is the only example of Australian film noir that I know of. The Year of Living Dangerously (1982). Good love story set in 1950s. Starring Kylie Minogue and Charlie Schlatter (18 Again!, Heartbreak Hotel). Criena Rohan, who wrote the novel on which this is based, is the aunt of tennis player Pat Cash. Ben Mendolsohn was orignally cast for the role that went to Charlie Schlatter. This was intended to launch Kylie Minogue into a career in film stardom, but it failed. I remember Monkey Grip featuring Christina Amphlett of Divinyls fame. Also, another Mad Max-like Aussie film called Dead End drive in. Also, a movie with Michael Hutchence called Dogs in Space which I have yet to see. Yeah, this is Australian version of Miami Vice. But what we have here is bad acting, bad story and so on. Some good songs on the soundtrack (Inxs, Split Enz, The Church) can´t save this mess. So this will only be an interesting curiosity. Their was a really good documentary released called Not Quite Hollywood: The History of Ozploitation. Tons of clips and interviews, lots of Quentin Tarantino, about Australian movies. Razorback, A Cry In The Dark, Picnic At Hanging Rock, Walkabout, Mad Max, The Proposition and Japanese Story are my fave Aussie films. Fortress, with Rachel Ward. Best one ever. Watched Malcolm (1986) last night. It was a good and sympathetic film, i liked a lot. Directed by Nadia Tass ( The Big Steal), this was her directorial debut. The movie stars Colin Friels, Lindy Davies and John Hargreaves. The cast did a good job and i really liked the unique score performed by a group called Penguin Cafe Orchestra. and Mad Max, and possibly a major influence on The Fast and The Furious movies. NOT to be confused with the 1988 movie starring River Phoenix ! Looks great, i want it! Seems that it was released in America as Fast Lane Fever. Ahhh. Saw Fast Lane Fever a year or 2 ago and felt it was a decent flick. Enjoy. Knowledge request.....how do you know if a flick has a different name at some poin. Also how to find out the original release on vhs. I just watched BMX Bandits, cheesetastic! I caught that documentary a while back on netflix and I thought it was terrific! Enjoyed Tarantino very much and the clips were awesome. I recommend it, even if you're not familiar with the Australian titles, definitely a good watch. "Starstruck" has been in my queue, I just need to check it out. I saw that great documentary and was amazed at how many Oz films I have not seen. Anyone have a copy of "Lady, Stay Dead," which has never been released on Region 1 DVD? Another good and sleazy Australian horror thriller. Lady, Stay Dead was written and directed by Terry Bourke. Starring Chard Hayward, Louise Howitt, Deborah Coulls, Roger Ward (Mad Max, Turkey Shoot), Les Foxcroft and James Elliott. and we got to watch few movies for free (we were young but the store owner let us choose any tape we wanted ). We took about ten tapes and this was one of them. Now, after some 26 years later, i finally got the VHS tape and saw the movie again. "Millionairess actress-singer Marie Coleby lives in a luxurious villa on a deserted beach. One afternoon following a TV commercial shoot at the villa she incites gardener Gordon Mason to mayhem and murder. The unexpected arrival of Marie's sister Jenny Nolan hinders Mason's attempts to dispose of the body. He then decides to kill Jenny. But she is equally determined to stay alive ... so begins a battle of wits. Officer Collings survives the initial siege.Then Jenny is alone to face Mason for the final time ..."
Fun little Ozploitation movie but be warned, lots of disturbing behavior on offer in this one. 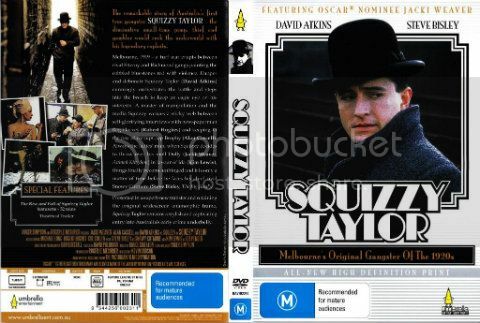 This was a pretty decent film set in the 1920s and based on the life of Melbourne gangster, Squizzy Taylor. Michael Long, Robert Hughes, Cul Cullen and Steve Bisley. The cast was good and i liked the lighthearted feel although the movie has its violent moments.